Listen to your teen’s concerns respectfully, and use positive parenting techniques. Set clear rules, such as no drinking or using drugs, no impaired driving, and never ride with others who have been drinking or using other drugs. Agree on appropriate consequences for breaking these rules. Enforce consequences when the rules are broken. Support the 21 Minimum Drinking Age law. Help parents, guardians, and families listen to their teen’s concerns respectfully, and use positive parenting techniques. Learn how to set clear rules, such as no drinking or using drugs, no impaired driving, and never ride with others who have been drinking or using other drugs. Work with parents, guardians, and families in developing appropriate consequences for breaking these rules. Want to bring the HCO to present about the Power of Parents? 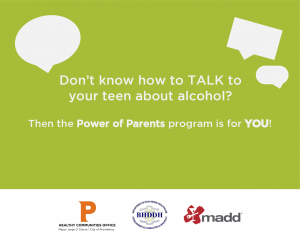 Power of Parents is a program developed by Mothers Against Drunk Driving (MADD) to reduce underage drinking. MADD is a nonprofit working to protect families from drunk driving, drugged driving, and underage drinking. The presentations are brought to you by the City of Providence Healthy Communities Office (HCO) with funding from the RI Department of Behavioral Healthcare, Developmental Disabilities and Hospitals (RI BHDDH).